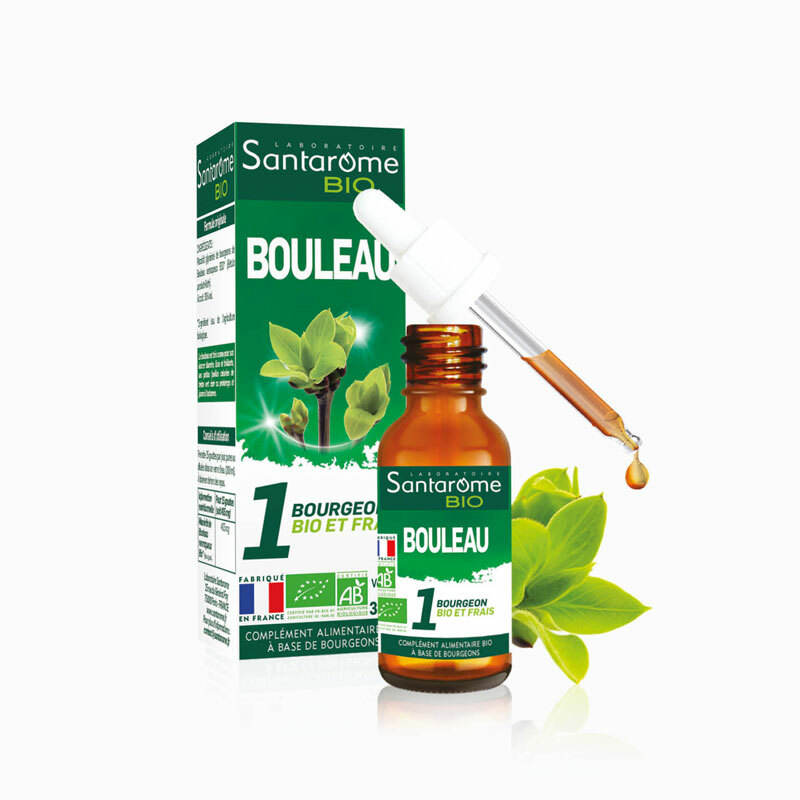 SANTAROME BOURGEON Birch 30ml in our pharmacy bio, Comment on advice for use and dosage with our partner Avis checked after your purchase. Two species of birch are used in gemmotherapy: Verrucous birch and Pubescent birch. → The pubescent birch differs from its colleague by its more diamond-shaped and simply toothed leaves. It is in spring that birch sap is harvested because it is at this time of the year that it is the most present. It migrates gradually to the sleeping branches to gradually inflate the birch buds. If birch sap is mainly produced in the spring, it is not a coincidence. We go out of the winter and our body needs a good drainage in order to bring out the accumulated waste: it is the famous cleaning of spring. In which cases can you take Santarome birch bud? At the level of the articular system: birch has an anti-inflammatory action capable of relieving joint pain and stiffness . Powerful remineralizer of the body, it regulates the phosphocalcic metabolism allowing a stimulation of the bone regeneration . At the level of the digestive system: Birch is an effective remedy in the treatment of different forms of hepatitis, often associated with other buds. Renal system: birch buds activate the diuresis of the body, allowing in particular the elimination of uric acid and cholesterol. Birch is also beneficial in case of water retention and cellulite. We advise you to take this mother macerate of birch buds outside of meals. For better assimilation: take the drops directly on the tongue and keep the macerate for a few seconds in the mouth before swallowing. You can also dilute the drops in a little honey or a little water. For adults : Between 5 and 15 drops a day, depending on the person and the problem. Start with 5 drops and increase by one drop each day until you get a stable result. For babies : 1 to 3 drops a day in the bottle or via the mother who is breastfeeding. For children up to 13 years : 3 to 8 drops a day, depending on the problem. Start with 3 drops and increase by one drop each day until you get a stable result. → As a cure , 3 weeks of daily intake, then one week off, for a maximum of 3 months. → In interview , one week per month. Comment on the recommendations for use and dosage of SANTAROME BOURGEON Birch 30ml with our partner Avis checked after your purchase. Glycerine Macerate of Bio Verrucous Birch Buds * (Betula pendula Roth) (405 mg). Alcohol: 30% vol. * Ingredient from organic farming - FR-BIO-01- Agriculture EU / NON EU. A dietary supplement should not replace a varied and balanced diet and a healthy lifestyle. Do not exceed the recommended daily dose. Keep out of reach of young children. Not recommended for pregnant or breastfeeding women. Excess use may result in laxative effects. The presence of a slight deposit due to the use of organic plants does not affect the quality of the product. The Santarome birch bud is in the form of a 30 ml pipette bottle. Gemmotherapy is part of the family of herbal medicine . It uses only the fresh embryonic tissues of plants, trees and shrubs, namely: buds, young shoots and rootlets. Did you know that the bud is the part of the plant that will never be affected by the disease? This leaves one to think about its powerful action. The Phyto formulas of Santarome Bio are distinguished by their dosage in unique plants and plant complexes for a real synergy of action. The association of buds enhances their effectiveness. For more than 35 years, the Santarome Bio laboratory has focused its efforts on formulating effective products of natural origin. We favor organic assets and producers. Quality controls at all stages of production attest to the natural origin composition of Santarome Bio products and compliance with certified organic manufacturing processes. The plants and buds of these products are guaranteed, in accordance with the regulations in force on the organic production method: They come mostly from French crops, and all our products are made in FRANCE.